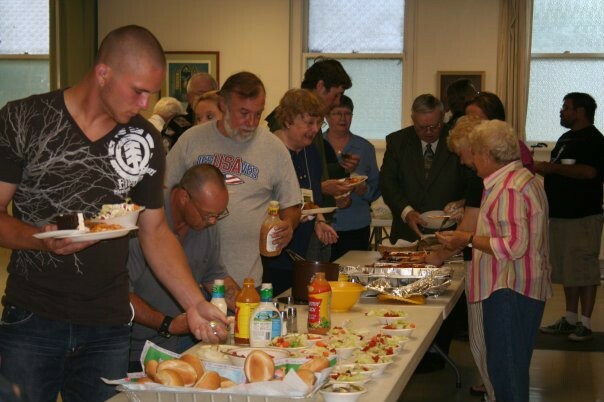 At the conclusion of the weekly worship service all members of the community are welcome to join in a Fellowship Dinner provided by one of the host churches. Families are welcome to attend worship and join in the meal as well. Together we share wonderful food, laughs, stories and continue to build and extend our community each week. Dinner preparation is facilitated by members of congregations which are supporting partners of Crossroads Connections, a small group from other congregations and service organizations, and occasionally by individual supporters. Worshipers always enjoy the non-institutional meals, whether it is home cooked meatloaf, fried chicken, sandwiches, pizza or chili. To view the upcoming worship and meal schedule, please click on the photo.